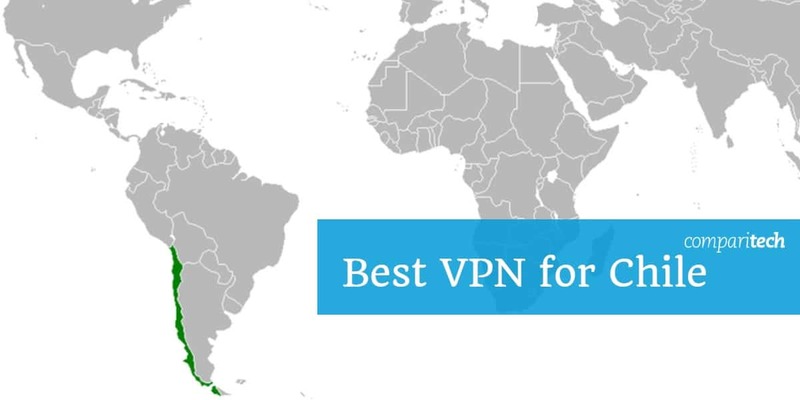 If you’re looking for the best VPNs for Chile in 2019, rest assured we’ve done the testing for you to find a VPN that works perfectly, keeps your privacy secure and offers the best value for money. If you’re visiting or traveling around Chile for business or on vacation, you might be concerned about connecting to the internet and the security of your data, or you may be thinking about how you can connect to online banking and streaming services you use at home such as Netflix. A VPN (Virtual Private Network) allows you to create a secure online connection to a network—in this case, the internet. VPNs are most commonly used to access restricted websites, block spying on your browsing activity, and provide protection against hackers or cyber criminals. If you don’t want to read the full article and the review of each VPN, here is a summary of the best VPNs for Chile. ExpressVPN: The best performing VPN for Chile. Excellent speeds, security and streaming of geo-blocked content. NordVPN: Good budget choice VPN with 5,000 servers and 8 servers located in Chile. IPVanish: A favourite with Kodi and torrent users. Zero logs policy keeps your data private whilst in South America. PrivateVPN: New VPN provider, good for streaming Netflix, BBC iPlayer and secure browsing in Chile. Surfshark: Good P2P enabled connections in Chile, along with secure encryption and support for unlimited devices. ExpressVPN tops our list of the best VPNs in Chile. With fast speeds, superb security, and a large network of servers to connect to, ExpressVPN delivers a seamless private browsing experience. ExpressVPN records zero logs when it comes to user activity, and does not capture your original IP address. By utilizing the OpenVPN protocol, alongside features like 256-bit AES encryption, and perfect forward secrecy, ExpressVPN is able to offer an extremely reliable service. A built in kill switch turns off your internet connection should your connection to ExpressVPN ever drop unexpectedly. This ensures your session remains secure at all times. ExpressVPN is also reliable when it comes to unblocking content and websites from regions around the world. The network delivers great results with Amazon Prime Video, Hulu, Netflix, Sling TV, and many more media services. When it comes to customer service and support ExpressVPN rates highly. A 24/7 live support service is available and support staff can also offer guidance on how to unlock features and access geo-blocked content if you get stuck. With apps available for iOS devices, Android and desktop versions for all the major platforms – Windows, Mac and Linux, ExpressVPN is accessible and easy-to-use. BEST FOR CHILE:ExpressVPN is our number one pick. Hard to beat on privacy and security. Has great content unblocking options, secure and speedy connections, and a host of security features. Works well in South America. Try it risk free with the 30-day money-back guarantee. NordVPN boasts over 5,000 servers in 62 countries, including eight servers in Chile, ensuring fast speeds no matter where you are connecting from. With a strict no logs policy, Onion Over VPN, 256-bit encryption, and IP address protection, NordVPN offers great levels of privacy and security. Other great features included within the NordVPN product include, a kill switch to protect your privacy if your VPN connection should unexpectedly drop, DNS leak protection, and a network set-up designed to overcome censorship, geo-blocking and unlimited bandwidth for streaming services. When it comes to streaming, you can enjoy all the platforms you love with NordVPN’s ability to easily unblock almost any geo-restricted site including Amazon Prime, Netflix, Sky TV and Sling TV. Should you need assistance setting up streaming of your favorite services the NordVPN website offers a knowledge base guiding you on the best servers to use for your requirements. Each NordVPN subscription allows six simultaneous connections with support for all major devices including those running on Windows, Mac, Android, iOS and Linux. BEST BUDGET VPN:NordVPN is our best budget VPN option for Chile. With great security and no logs it keeps your information secure at an affordable price. Includes 30 day money-back guarantee. CyberGhost currently has a wide network of around 3,500 servers around the globe with 10 located in Chile. Cyberghost offers a ‘NoSpy data center’ that prevents mass surveillance and isolates servers from third-party meddling. These servers use 256-bit AES encryption and are located in Romania, where local legislation does not enforce data gathering or other mass surveillance tactics. This means Cyberghost can guarantee their no-logs policy. The service is also great at unblocking geo-blocked streaming from services like Netflix and BBC iPlayer. There’s even a guide built into the app that helps you get set up for streaming your favorite service. An internet kill switch, DNS leak protection, perfect forward secrecy, with extra security features such as anti-malware defense and an ad blocker give CyberGhost robust security. CyberGhost is compatible with Android and iOS mobile devices and Windows, or MacOS. A subscription allows for seven devices to connect to the VPN service at the same time. GREAT VALUE:CyberGhost offers a great value VPN for Chile. The service is ideal if you want to stream UK or US Netflix and BBC iPlayer plus many other location restricted streaming services. CyberGhost also comes with a 45 day money back guarantee included. IPVanish offers some great advantages for users in Chile. With zero logs and a strict policy against the collection of connection and activity data, user privacy is securely protected. Unlimited bandwidth, 40,000 IPs with unlimited server switching, plus an easy to use VPN app for every device make IPVanish extremely user friendly, too. IPVanish uses 256-bit encryption on OpenVPN and IKEv2 and L2TP/IPsec VPN protocols. A VPN kill switch is embedded within the system, alongside DNS leak protection. While many VPNs rent some or all of their server network, IPVanish is one of the few that owns all of its servers, giving a big advantage on maintaining security and anonymity. We found that IPVanish does not deliver the best results in the market for unlocking geo-restricted content on Netflix, but scores better in other streaming tests such as speedy delivery of YouTube content and anonymous torrent downloads. IPVanish has also made our lists for the best budget VPNs and the best Torrent VPNs, and it offers a 7-day money back guarantee alongside 24/7 customer support. If you’re looking for a mixture of good features and value for money, IPVanish should make your shortlist. UP TO TEN DEVICES:IPVanish is popular for torrenting, with no logs, strong encryption and above average speeds. Includes a 7 day money back guarantee. Read the full review of IPVanish Review here. PrivateVPN delivers protection for your personal information and keeps your details secure from hackers and thieves. With good speeds and the ability to hide your IP address and location for anonymity and privacy, PrivateVPN is a strong all round VPN. However, with only around 90 servers and only one server located in Chile, it does not score as well for server options as some other VPN providers. Despite this, there are other great features that ensure PrivateVPN makes our shortlist. With no data log, unlimited streaming and torrenting support, PrivateVPN provide many of the features users want from a VPN. Access to streaming services includes BBC iPlayer, Netflix, HBO, and Amazon Prime Video. Security features include 128- and 256-bit encryption, perfect forward secrecy, an internet kill switch, and DNS leak protection. Even the basic subscription plan allows six devices to connect to the VPN service at the same time. Usability is enhanced with simple apps for Windows, MacOS, iOS, and Android. GREAT SPEED:PrivateVPN has a focus on quality and a small number of servers that still deliver fast speeds. It unblocks streaming services like Netflix and Amazon Prime Video. PrivateVPN comes with a 30-day money-back guarantee. Surfshark offers users a standout feature – an unlimited number devices can connect to the VPN service on one subscription. Surfshark also does well when it comes to the traditional features you want from a VPN including strong encryption, zero logs, and an integrated kill switch to keep you secure should your VPN connection drop. Surfshark is great for connecting to most of the major streaming services including Netflix and BBC iPlayer, and unblocking works on most of the servers the company operates. Other features worth noting include P2P file sharing and decent speeds for streaming and downloads. The Surfshark service also provides easy to use apps for mobile and desktop devices on Windows, MacOS, iOS, and Android. EASY TO USE:With Surfshark you can unblock streaming services, and enjoy an easy to use app, along with fast streaming speeds. Surfshark comes with a 30-day money-back guarantee. Can I use a free VPN in Chile? As a rule, we recommend avoiding free VPNs in Chile. Free VPNs often make their revenue by spying on your online activities and selling your data to third-parties and advertisers, negating the effect of using a VPN in the first place. Some free VPNs have been known to inject tracking cookies into your browser and some free VPNs can even carry malware. Alongside these security fears, free VPNs also have compromised performance. They typically have smaller server selections, with data caps and/or bandwidth limits, and they can be slow due to overuse from a large pool of users. In general, Chile is a user-friendly country, however, cybercrime is a threat and even one of the countries biggest banks, Banco de Chile, said a hacking operation robbed it of $10 million in June 2018. In August 2018, U.S. Defense Secretary Jim Mattis and his government counterpart in Chile signed an agreement pledging better cooperation in combating cybercrime. Despite this, there are still some concerns for internet users whilst on Chilean soil. ISPs in Chile are supposed to record their users’ data since the official authorities require them to. There have also been some concerns about expressing political views in Chile and the monitoring of journalists. On March 12th, 2018 The Committee to Protect Journalists expressed concern on reports that Chilean police spied on reporters as part of an intelligence operation. It was reported that Chilean police intercepted WhatsApp messages, phone calls, and Telegram messages, between journalists and their sources. One of the biggest problems is that the legal framework that allows for the surveillance of communications in Chile is made up from extremely vague rules and obsolete laws that do not match the rapidly changing technology landscape and the current reality of communications. The use of a VPN can unblock access to geo-restricted Chilean TV channels overseas. Chilean citizens traveling abroad who sign up to one of the VPNs recommended on our list, will be able to watch their favorite TV channels from home. To access blocked Chilean channels select a server from Chile when connecting to the VPN provider, and the channels below should be accessible from anywhere in the world. 8 Can I use a free VPN in Chile?